The operational safety and durability of a maintenance-free or low-maintenance bearing position depend not only on the load collective and lubricant for lowmaintenance bearing positions, but also on the material and surface of the interacting sliding part. 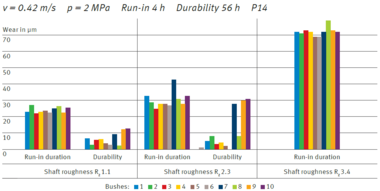 The materials of the interacting sliding parts may exert a considerable influence on the wear properties and durability of the plain bearing (see table “Correction factor”). For good tribological conditions, the interacting sliding partner should be as hard (HRC > 45) and smooth (roughness depth Rz 0.8 to 1.0) as possible here. Tests with different shaft hardness levels show increased lifetime wear when shafts with lower hardness levels or a higher surface roughness are used. For plain bearings made from P1 materials, it is always advantageous in terms of durability to use interacting sliding parts with a hardened sliding surface, or one featuring a special coating. This is particularly the case under higher stresses or at higher sliding speeds. If the shaft material can not be hardened further, the surface of the journal should be finely ground. Sanding marks across the direction of movement or machining grooves and swirls should be avoided. For lead-free materials like KS PERMAGLIDE® P14, tin-bronze is used, for example, which is harder than the lead-bronze used in the material P10. 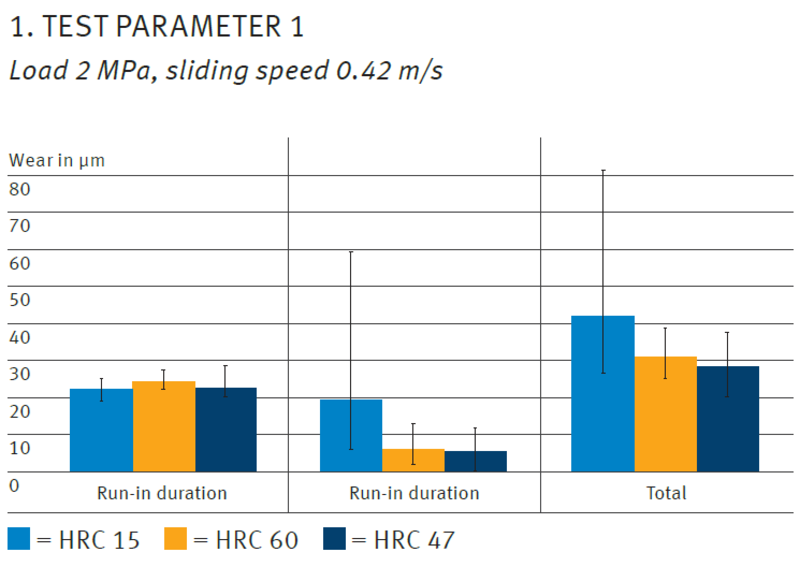 With lead-free KS PERMAGLIDE® P1 plain bearings, a hard interacting sliding partner with HRC > 47 is therefore recommended. This results in less wear on the material and the interacting sliding partner is less affected. The surface roughness of the interacting sliding part is also extremely important in respect of the operational safety and durability of the tribological pairing. 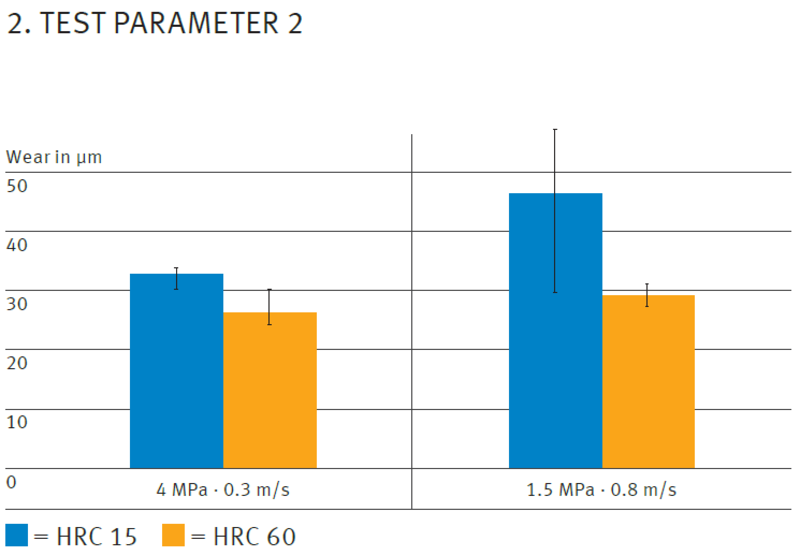 The most favourable friction conditions are achieved with a surface roughness of Rz 0.8 to Rz 1.5. For plain bearings made from P1 materials, the solid lubricant cannot stick sufficiently to the interacting sliding part if the surface is too smooth. Adhesion repeatedly occurs during the sliding movement, resulting in stick-slip effects, squeaking noises and problems during operation. If the surface of the interacting sliding part is too rough, on the other hand, the available solid lubricant in the plain bearing is no longer adequate for producing a sealed lubricating film on the interacting sliding part. The consequence is abrasion, together with increased friction, a rise in temperature and increased wear. With plain bearings made from P2 materials, abrasion occurs with increased wear despite the use of grease as a lubricant with larger roughness depths.